This is the second in a series of guest posts from Niseko Projects, where Dominic Wehner discusses property development and leads clients through the process of building and maintaining properties in the Niseko area. A Ski-Lodge or ‘chalet’ often evokes strong images and feelings of rustic natural materials and textures and perhaps even a feeling of ‘sanctuary’ from the elements. Perhaps images of lodges or chalets in the Canadian Rockies or the French Alps come to mind. This article looks at the specific interior design elements that are often associated with a purpose built ski lodge, so you can get it right first time when planning your new second home in Niseko. For discussion on the Exterior design features of an alpine property, see this post on Alpine Design Basics. When you enter an Alpine chalet or lodge, one of the things you often notice is the use of at least two doors, creating an ‘air lock’ around the entrance or boot room. This is intended to prevent an icy blast of frozen air and snow blowing into your living quarters every time someone comes in the front door. It is also an energy efficiency measure to help prevent the loss of your carefully regulated internal climate. This is of course especially important if you have a large number of guests or children coming and going from the property. It is in this entrance where features of the western ‘Boot Room’ and the Japanese entrance or ‘genkan’ meet. You can read more about the traditional aspects of the Japanese entrance in this post on The Japanese Genkan. The entrance will ideally provide a large bench where ski boots or snow shoes are removed, and slippers donned before entering the house proper. Wet weather gear is often hung up in this room, and under floor heating helps to melt snow off jackets and boots while also providing a warm welcoming atmosphere. The entrance / boot room may also incorporate a ski or snowboard rack or have an adjoining dedicated ski room. It is also useful to have direct access to the laundry and dry room from the entrance so that wet gear can be quickly sorted before moving into the living areas. It is important to remember that a ski chalet is almost always a second house and not a primary residence. This important difference effects the way the property is used, as well as the design of hot water supply and space heating systems. Using an architect or project manager who understands these differences will often save the owner considerably over the life of the property. A holiday house often caters for guests, or a second family sharing the property. A well designed ski lodge will consider capacity for all at the dining table and lounge + guests. Separating the master suite from the guest suite on different levels provides maximum privacy while sharing a house. Conversely a large kids room with bunks and space for children to share and play games allows for maximum fun for the kids while at the same time allowing space for the adults to enjoy wine and conversation around the fire after dinner. It is also increasingly common to provide a staff or helper’s quarters, both for the owners and also the luxury rental market. A dedicated ski chalet will often have living areas on the second level in order to lift the views up out of the snow that mounts up around the property. With the resort averaging around 15m of snowfall every year, snow rapidly builds up around the property often impairing views and light into the lower floors. By lifting the living areas to the second storey, views and light are maintained. As ‘heat rises’, living areas are generally warmer with heat naturally rising up from the lower floors. 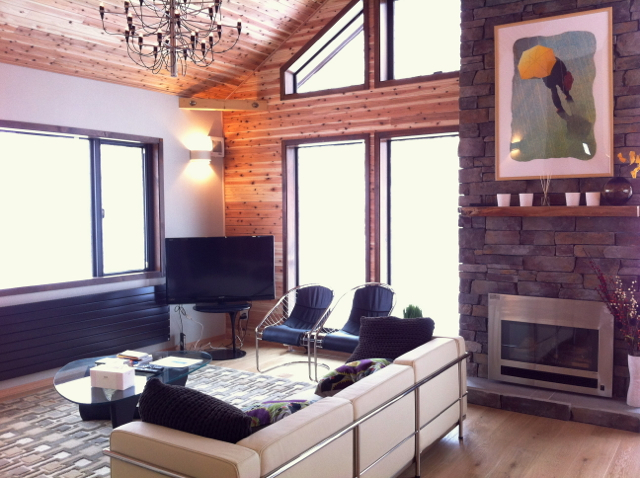 The fireplace is often described as the heart of the home and is often the defining feature of a ski chalet or lodge. Decorated with rich natural materials such as rustic timber and stone it is often the centrepiece to a grand living area or ‘great room’. However as a holiday home, the fireplace cannot be the primary heating source of the property, and the owner would no doubt rather spend time with the family on the slopes than cutting, stacking and storing firewood and keeping a good fire stoked. Thankfully Gas fires can be started with the push of a button and provide all the appeal of a log fire without the fuss. Luxury lodges usually require en suite bathrooms for both the master bedroom and the main guest suite. Secondary bedrooms / staff rooms and kids rooms may share a bathroom. A separate toilet located near the living and dining area is also usually required for dinner guests who may not be staying at the property. Depending on the specification level of the property bathrooms may be either custom tiled or use a Japanese unit bath or shower. For more information about Japanese bathrooms please have a look at this article on The Japanese Bathroom. Taking care of the details such as having a shelf or ‘locker’ for clothes while bathing adds polish to the bathing experience. If you and your family love to cook and entertain or you are also appealing to the luxury rental market, a well-designed kitchen with the appropriate appliances will be a necessity. The type and specification of appliances is an important consideration as Japanese domestically produced models will usually have their operation menus in Japanese only. Some foreign appliance companies such as Miele, or AEG Electrolux do have more familiar western style appliances produced for the Japanese market but these will often command a premium price over Japanese brands. A good sized pantry and possibly even a wine fridge are also best considered from the outset as these are very difficult to add later after plans have been drafted. Japanese counter heights are also usually lower than western counter heights as standard but a good project manager will be aware of these issues and manage this during the construction planning stage. Rubbish recycling in Hokkaido is also very strict and planning space for multiple rubbish bins for easy separation is important if you are to avoid having additional garbage cans or bags placed around the kitchen. 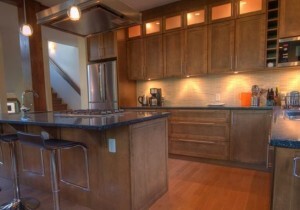 Home automation is often overlooked during the design phase but is one of the details that adds ‘polish’ to a property. Home automation can provide central control of one or all of the following systems; climate control, lighting, security and audio visual systems. In its most basic form built in audio speakers can provide a lovely ambiance for very little additional cost over stand-alone models. There are many unique interior design features attributed to an alpine ski lodge, but with good local management and guidance from someone well versed in the intricacies of Alpine design many potential pitfalls can be avoided. Niseko Projects provides a single point of contact for all design requirements, supervision and Furniture procurement, and will ensure that all elements of the building or construction project are coordinated from the initial concept through to completion of interiors. Dominic Wehner comes from a construction and management background in New Zealand and has a deep, long-standing interest in building and design. Dominic has been living with his family in Japan for over 10 years and can bring a rare combination of skills and local experience to your development project. The original article from Niseko Projects can be found at – http://nisekoprojects.com/ski-lodge-interior-design-essentials/ – or visit the Niseko Projects Blog to read more articles from Dominic.